The rufous hummingbird is widely acknowledged as the most aggressive of the North American hummingbirds. Despite also being one of the smallest hummingbirds, and this tiny copper-colored member of the Trochilidae family will readily attack birds many times its size. Yet even with a territorial attitude, this hummingbird is a welcome and beautiful addition to many yards in western North America, and is a surprising eastern guest in some winter yards as well. Learn what makes this orange hummingbird so distinctive through this informative fact sheet. While small birds like hummingbirds can be challenging to identify, the rufous hummingbird has several distinct field marks that make it easy to recognize. Males have a rusty crown, back, and flanks and an iridescent copper or red gorget, though the throat can look dark or black in shadows or poor light. The shoulders may be slightly green and some males have a green wash on the back, though an orange back is more common (only 5-10 percent of rufous hummingbird males show a green back). The chest is white and there is often a white streak down the abdomen, giving the bird a vest-like look. Females have a green head and back with a white, slightly speckled throat that may show a red or orange central splotch. Females’ sides and chest are buff-rust. The wings and eyes of both sexes are dark and the birds have pointed, notched tails. On males, the tail is orange with black tips, and females have rust at the base of the tail, green in the center, and black tips, with white tips on the three outer tail feathers on each side. Juveniles look similar to adult females but have less rich color and less streaking on the throat. Juvenile males develop more color on the throat and more rust on the underparts throughout the winter. Rufous hummingbirds have a variety of high-pitched, rapid buzzing, chattering, and chipping vocalizations that are frequently part of their threat displays. Their wings also make a high-pitched buzz during flight, particularly dives. Rufous hummingbirds are the most northerly hummingbird species. Their breeding range extends through the Pacific Northwest, western Canada, and into southern Alaska. The birds prefer deciduous or mixed coniferous forests, mature parks, or yards, often with widespread flowers or forest edges that border flowering meadows. These hummingbirds follow a circular migration route each year. In spring, they are most common in coastal areas, while in summer and during fall migration, they are more common in mountain regions, completing an annual circuit of their entire northern range. In winter, the birds migrate to southern Mexico. A large number of vagrant rufous hummingbirds have been spotted in the eastern and southern United States during their migration period and may overwinter there, particularly in mild years or if there are plenty of supplemental feeders. Birds that do complete the migration from southern Alaska to southern Mexico have the longest migration route of any hummingbird species, a one-way trip of up to 3,900 miles. Rufous hummingbirds are a solitary species and are very defensive and aggressive near feeders, particularly during migration. These fiesty birds will even exhibit threat displays at other creatures, including squirrels, pets, and humans. Threat displays include diving, tail fanning, and other visual demonstrations. To watch for intruders, rufous hummingbirds will perch on a high, open branch when not feeding. Like all hummingbirds, rufous hummingbirds visit flowers for nectar. They will also eat sap, insects, and spiders, even hovering or darting about to catch gnats and small flying insects in midair, or to pluck insects that are stuck in spiderwebs. These orange hummingbirds can be very protective of prime feeding spots, and will often perch nearby to guard the area and chase other birds away, including other hummingbirds as well as larger species. Rufous hummingbirds are polygamous and will mate with several partners, with males tempting females with oval or J-shaped dives and figure-8 courtship displays. A female builds the cup-shaped nest of plant down and spider silk decorated with moss, lichen, and bark, typically positioned as high as 30 feet in a tree. These hummingbirds produce 1-2 broods of 2-3 plain white eggs each during the breeding season, and the female incubates the eggs for 12-14 days. After hatching, the female cares for the nestlings for 19-21 days, until the young birds are able to leave the nest. Males have no role in nest-building, egg incubation, or chick care. Rufous hummingbirds have been recorded as hybridizing with Anna's hummingbirds, calliope hummingbirds, and Allen's hummingbirds. Rufous hummingbirds are not threatened or endangered. They are susceptible to hummingbird predators and loss of habitat, however, particularly in their breeding grounds in the Pacific Northwest, where surveys indicate slow, ongoing population declines. Minimizing pesticide use that can harm food sources and planning hummingbird gardens to support the birds year-round are effective conservation techniques. 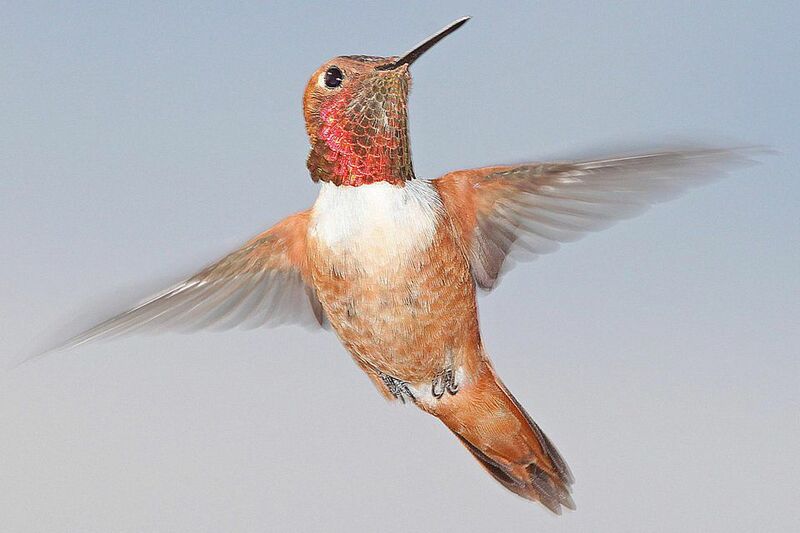 Rufous hummingbirds are commonly found in yards planted with red, tubular flowers and good nectar-producing blooms. The birds easily feed from hummingbird feeders, though birders should consider using multiple feeders to minimize the birds’ aggression. Leaving perches available can also help attract these hummers, as they will have a convenient spot to rest and watch their territory. Minimizing insecticide use will ensure plentiful protein for feeding hummingbirds. In the field, rufous hummingbirds stand out thanks to their colorful plumage. Visiting areas with abundant, nectar-rich flowers is ideal for spotting rufous hummingbirds, and they will readily come to nectar feeders available at nature centers, botanical gardens, and wildlife refuge visitor centers. Listening carefully can help birders note these birds' distinctive buzzy wings, which can help locate such tiny birds. Hummingbirds are some of the most beloved birds, and if you love the rufous hummingbird, you won't want to miss these other stunning hummingbirds. Be sure to check out more of our informative bird profiles!